This year the Presbyterian Church of Korea celebrates the 110th anniversary of its first presbytery meeting. But Presbyterianism in Korea did not begin in 1907. It began 23 years earlier, in the tense aftermath of an assassination attempt. Although there had been Christianity in the “Hermit Kingdom” since the 17th century, including Roman Catholic Jesuit missionaries, the first Protestant resident missionaries to enter Korea were Dr. Horace N. Allen and his wife, Frances, both former missionaries to China. Dr. Allen did not travel to the Korean peninsula as a missionary—a type of visitor prohibited by the Korean government of the time. Rather, he arrived in September 1884 to work as a physician to foreigners living in Seoul. Korea was divided between pro-Japan progressives who wanted modernization and pro-China conservatives who wanted the kingdom to remain isolated. In December 1884, the progressive faction attempted to assassinate conservative members of the government. In the resulting melee, Prince Min Yong Ik, the queen’s nephew, was wounded. Luckily for the prince, Dr. Allen arrived at his bedside to advise court physicians against pouring hot pitch into his open wounds. Dr. Allen went on to oversee the prince’s treatment and recovery and to become his personal physician. The court thanked Dr. Allen for his work with a gift of $100,000; he also received permission to open a hospital. With help from the Presbyterian Church in the U.S.A. Board of Foreign Missions, Dr. Allen oversaw the new royal hospital, which continues today as Severance Hospital. 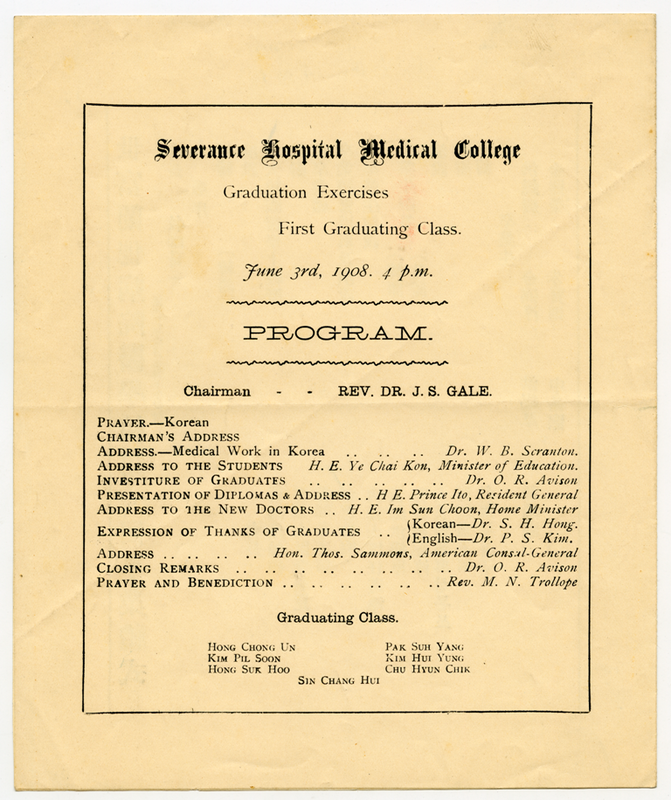 Dr. Allen’s role in the treatment of the prince had opened the door for Presbyterian mission work in Korea. Other Protestant missionaries soon followed, including Methodists and representatives of the Church of England. Another Presbyterian missionary, Dr. Horace Underwood, arrived in 1885. By April 1886, he was teaching chemistry and physics to a medical class at the royal hospital. Like Dr. Allen, Dr. Underwood also taught Christianity. It is believed that Dr. Allen’s interpreter, No Tahsa, was the first Korean Protestant to be baptized. The first Presbyterian church on the peninsula was established in 1887 in Seoul. The Presbyterian Church in the U.S. entered Korea in 1892 after a vigorous public awareness campaign spearheaded by Horace Underwood and alumni from Union Theological Seminary in Richmond. Horace’s brother, John Underwood, who founded the Underwood Typewriter Company, gave $2,000 for missionary work in Korea. Although foreign missionaries played an essential part in the Korean church’s beginnings, native Koreans quickly assumed leadership roles. One reason for this was the Nevius Plan. Dr. John Nevius, a missionary in Shantung, China, devised a method for successful mission work that he was never able to implement in China. But it found adherents in Korea. One of the Nevius Plan’s main principles was self-support. Church pastors and buildings were not to be paid for using outside missions funds, requiring a large amount of self-sufficiency from native converts. Christianity found a willing audience among Koreans at the turn of the century. A historian could pen an entire book on why Koreans were so receptive to Presbyterianism, as well as other Christian denominations. The first major factor was that Korea fell under Japanese control in 1905 after the Russo-Japanese War. Under a peace treaty, mediated by President Theodore Roosevelt, Japan assigned a resident general to Korea who would provide for the nation’s security and dictate its foreign affairs. When the Korean emperor and his ministers refused, Japanese troops surrounded the Imperial Palace and imprisoned the prime minister. Under Japanese control, Korea suffered forced labor, martial law, and the confiscation of property. Despite armed resistance, the Japanese eventually annexed Korea. The second factor was a revival movement in 1903 begun by Methodist missionaries. The new religious fervor, combined with the political uncertainty and hostility to Japan, made Korea a fertile ground for Christianity. The number of Christians in Korea quadrupled from 50,000 in 1905 to 200,000 in 1909. The need for pastors became so great that a seminary was created in Pyongyang. Its first class graduated in 1907. 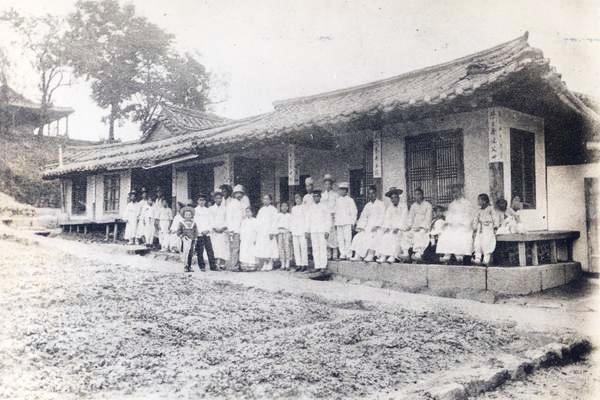 The Presbytery of All Korea was established on September 17, 1907. The general secretary was Samuel Austin Moffett, who had arrived in Korea in 1890 and became the first resident protestant missionary in Pyongyang; the vice-moderator, stated clerk, and assistant clerk were all native Koreans. The membership of the new presbytery was 38 missionaries and 40 Korean elders. The presbytery’s first act was the dissolution of a missionary council that had previously directed all Presbyterian mission work in Korea. The intention was clear: the future of Presbyterianism in Korea would be largely directed by Koreans. Next, the presbytery approved the ordination of seven seminary graduates and created a Board of Foreign Missions, which sent one of the seminary graduates, Poong-Ki Lee, to the island of Cheju. Allegedly, Lee was one of several men who had thrown stones at early Presbyterians preaching in Pyongyang. 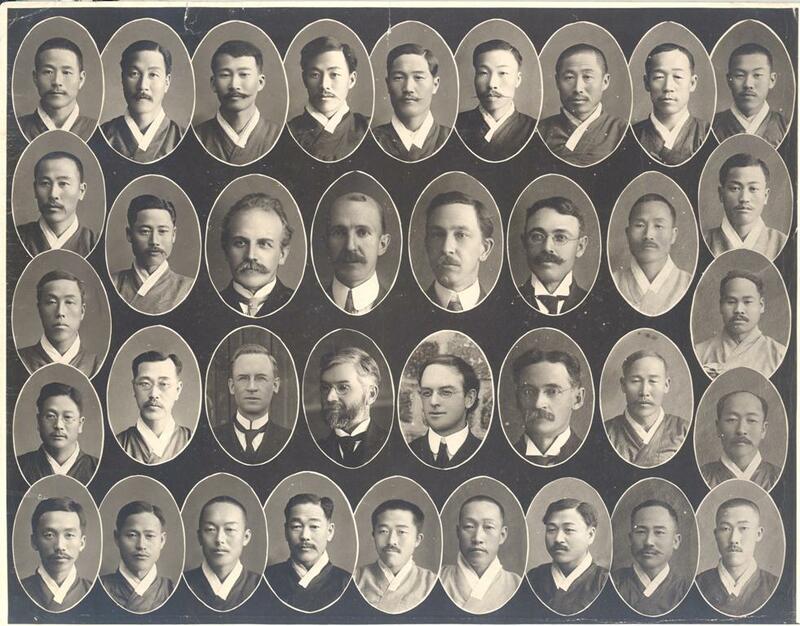 The first general assembly of the Presbyterian Church in Korea took place in Pyongyang in September 1912. Despite turbulence within Korean society, the growth of the Presbyterian Church of Korea over the coming years was remarkable. By 1919, the church had 192 pastors—up from 40 in 1910—and a membership of 60,954. Presbyterianism in the Hermit Kingdom had taken root and flourished.